Climber maps contain up to 33 variants of how to climb mt Aconcagua from the South, East and Northwest faces. Besides, some routes have more than one name. No wonder it creates a lot of confusion. In fact it is simple. The Normal Route. Goes through Horcones Valley. Non-technical. The Polish Traverse Route. Starts at Vacas Valley, then turns to Relinchos Valley, passing by beautiful Ameghino Peak (5952 m / 19530 ft). Also known as the False Polish Glacier Route or the Ameghino / Upper Guanacos Traverse. Non-technical. The Polish Glacier Route. Technical. Commercial expeditions will run one of the above with the Polish Glacier as a non-standard option or as a separate expedition once – twice per season. It is no problem to outfit your personal expedition, outsourcing logistics from Mendoza to the Base Camp from local providers. from the summit down (2 days). When choosing a route you would like to maximize the pleasure of the first three stages, since the last one is short and your thoughts will be still on the summit. Wind is a common denominator for any route. Every day thermal winds are switched on at about 8:00 – 9:00 a.m. and switched off after 06:00 p.m, if you are lucky. If you are not lucky, the wind will howl all night long, ripping your tent in the manner it would do over the Everest South Col. The Normal Route / Horcones Valley. The Normal route starts at the beginning of Horcones Valley (2950 m / 9700 ft) and follows the Horcones River to the Base Camp “Plaza del Mulas”. Half way on the Normal Route, from Confluencia (3390 m / 11120 ft), you can also trek to Plaza Francia, but non-technical ascent to the mountain is not possible from there. The distance from the beginning of the trek to Plaza del Mulas is 35 to 40 km (22 – 24 miles) and typically it is covered in a 3 days trek. For acclimatization climbers stay for 2 nights mid-way at Confluencia, making acclimatization hikes to Plaza del Francia or elsewhere. Extended trips offer an extra day of acclimatization either on the approach or at the Base Camp. A very good idea. The Horcones River valley is much wider comparing to Vacas / Relinchos Valleys: wind gains the momentum there! The terrain is sand and dust with occasional scree. While the route is forgiving for ankles, it’s harsh on respiratory system. In one day my bright-red boots and my friend’s anthracite ones became of exact same yellow-brownish colour. So did our pants, at least knee-high. Trek to the Base Camp gains altitude in big “steps”: long and steep ascents are followed by long mellow, almost flat marches, requiring combination of stamina and patience. Plaza del Mulas (4300 m / 14100 ft) is a busy Base Camp surrounded by two metal toilet boots with great views. Lots of meeting – talking – mingling opportunities and not a lot of …clean water. The nearby stream is shallow and looks quite polluted. Take extra precautions and purify your water yourself. With 4 l to drink a day, it becomes a full-time job, but GI bug at this stage may ruin the whole expedition. Camp 3 – Berlín (5930 m / 19,455 ft) before going to the summit. Some expeditions choose to traverse left on arrival at Refugio Berlin and go to the Camp Colera, also known as “White rocks”, which is 50 – 100 m higher. The Camp Colera is about 30 min – 1 hrs walk from Refugio Berlin and it may be cleaner during the peak season (but may not). Its definite benefit is that it gets morning sun earlier than Refugio Berlin. The Polish Traverse Route has the Camp Colera as its High Camp. In case of perfect weather a standard itinerary suggests going from Penitentes (2630 m / 8500 ft) to the summit (6962 m / 22,841 ft) in just 12 days, which is very fast for the altitude gain of almost 4,5 km/14700 ft.
An extended itinerary adds 2 days and is much better for acclimatization. In both cases perceive extra “weather days” as a gift of God. Every additional day spent below 6000 m / 19700 ft will make you much stronger for the summit bid. If you feel like taking it slow – midway between Plaza Canada and Nido de Condores there is an option for a camp – the Camp Alaska. The summit is a long day and two next days are no shorter. Standing atop is magnificent, but do not relax – it is a midway at best. Put mental on “marathon” mode. The last 3 days of the expedition are the most difficult – that’s what you have been training for. Leaving Camp 3 at about 5 am you will be back between lunch and dinner. Next day is going 2,5 km /8200 ft down to Plaza del Mulas for celebration and packing. The last one is a 35-40 km trek down to the Horcones valley entry point. Congratulations! You have arrived now. The Polish Traverse Route / Vacas – Relinchos Valley. The Polish Traverse starts at Puente del Vacas (2400 m / 7900 ft) and follows Vacas Valley to the first trekking camp Pampa de Lenas (2900 m / 9330 ft) and the second trekking camp Casa de Piedra (3240 m /10655 ft) where it turns to Relinchos Valley until reaches the Base Camp – Plaza Argentina (4200 m / 13800 ft). The time spend on approach is exactly the same as on the Normal route – 3 days, but you get to sleep at different camps every day, covering about 60 km (37 miles). Changing scenery is nice. Vacas Valley is an elegant narrow valley: ice-green waters and alpine meadows. The first day of the hike is very enjoyable. On the second day the terrain gets rocky (watch you ankles) and you get THE WIND. Vacas is dusty, but not as dusty as the valley on the Normal route. Just a few hundred meters before arriving at Case de Piedra your full day of jumping on rocks will be rewarded by the stunning view of Aconcagua. Breathtaking, it tours above the valley. It seems unbelievable that you will be standing atop this magnificent giant in just 12 days. And you will. The morning of the third hiking day will bring some fun: crossing the ice-cold Vacas River. I’m slow to wake up in the morning and that definitely helped! Morning sun is hugging the river crossing point 30 min to an hour AFTER you have to step into the water, so at 3240 m it will be cold-cold-cold. A few minutes in the water and all your foot-senses are gone. The river’s depth depends on the season, usually about knee-deep. A small towel is great to rub ice-cold non-sensitive feet on arrival to the other bank. Besides, wearing dry socks definitely feels better than wearing wet! Going up by the Polish Traverse and down via the Normal route is circumnavigating the mountain. Perfect way to enjoy the beauty of this place, but there is a catch (see “Descent”). Plaza Argentina is a lovely camp. Busy, but not as busy as Plaza del Mulas and it sits 100m / 330ft lower. A quick stream nearby is a good water source and makes for a very refreshing shower. You will spend +/- a week in a base camp, counting acclimatization hikes in the vicinity; so good water is essential for your health and readiness to continue with the ascent. Camp3 – Colera (or Piedras Blancas “White Rocks”) 6000 m / 19,670 ft.
Camp 1 and Camp 2 have a source of fresh water, Camp 2 almost stands on a frozen river, and you need to make a hole through the ice to get the water. Frozen rivers are the reason you may need to wear crampons on approach to Camp 2. Depends on a season. No water source at Camp 3, but snow can be melted – stock on fuel and leave some water you could drink on arrival. The summit push is similar for all non-technical routes. From Camp 3 you go up via Independencia Hut (~ 2,5 hrs walk). Half way there the Polish Traverse merges with the Normal Route. From there ascent on the similar terrain to the Windy Crest and then follow the long windy traverse to the foot of the last steep section – La Canaleta. La Canaleta ends atop Cresta del Guanaco, the ridge that connects the lower South with the higher North Summit of Aconcagua. You are almost there. Follow the crest and in 10 – 20 minutes you are standing atop Mt Aconcagua! Having started at 5:00 – 6:00 am you will definitely be back by dinner or earlier. The next steps are clear. Drink. Eat. Sleep. Pack (a very heavy backpack) and get 2,5 km /8200 ft down to Plaza del Mulas. Drink. Eat. Celebrate. Celebrate some more. Pack. Sleep. Descent. If you have come up to Camp 3 from Plaza Argentina and are planning to come down via Plaza del Mulas, be prepared not to get your duffels at the Base Camp. Miracles may happen, but do not count on it. Either accept living in the same “high mountain” clothes till the end of the expedition or take an extra load with you on the way to Camp 3. We have compromised, taking fresh minimum of shirts / socks and undies. The problem is – Plaza del Mulas is a detour for mules on the way from Plaza Argentina down, so on the way back duffels and expeditions usually do not meet. If you are not personally in charge for the expedition logistics, discuss the duffel situation with your outfitter in advance. Explain that it would influence your packing and demand a straight answer. If the answer goes “50% – 50%”, it means 99% you will not see your duffels at the Base Camp. Marching down a 35 – 40 km (22-24 miles) from Plaza del Mulas in climbing boots and Gore Tex is not a dream scenario. Taking Gore Tex down is not possible due to dusty-sandy winds. Stiff climbing boots do not help to jump on scree and rocks. Honestly, I do not know a solution to this one. Packing hiking shoes / pants / light jacket on a way up would add another 2-3 kg to the back-pack, which is already very heavy. It’s suffer on the way up, or suffer on the way down. Virtually it is the only disadvantage of this route. The Polish Traverse is a “standard technical route”. Can be divided into Polish Direct A & Polish Direct B. It starts from Plaza Argentina and from all technical routes it is “less technical”, thus the most popular option. 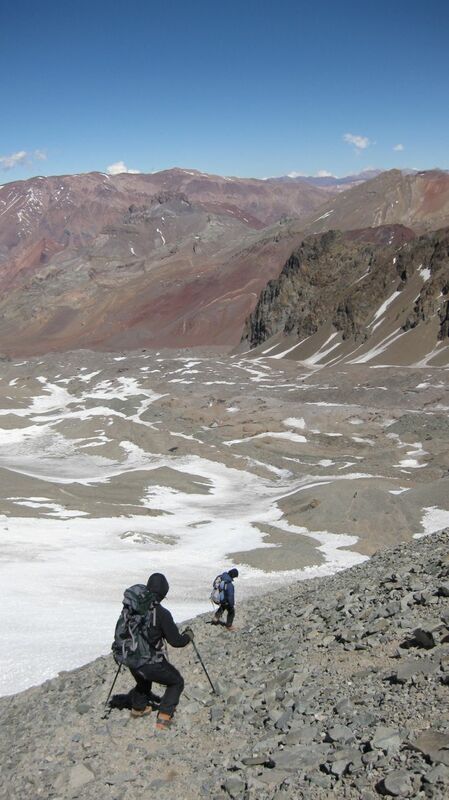 The Route allows climbing Mt Aconcagua, while the Normal routes are more of a hike up. It is not uncommon that climbers opting for the Polish Direct change their mind high on the mountain and go via the Polish Traverse instead. It is a good option – you can challenge yourself to the utmost and still have not only a descent retreat, but also the summit. Factors beyond your control can dictate this decision, such as the route condition (deep fresh snow) and weather. From the Base Camp (Plaza Argentina) double carriages are made to higher camps in “carry high, sleep low” fashion. The route follows the Polish Traverse route roughly up to Camp 2, where the Polish Traverse takes to the left and circumnavigating the mountain, slowly gains altitude to Camp 3 / Colera. From Camp 2 the Polish Direct goes straight up, as the name suggests, crossing the Polish Glacier to the Summit. The summit day is arduous, gaining over 1000 m in a steep slope of snow and ice. Descent is usually made back to Camp 2 from where teams choose between the options to go down to Plaza Argentina and out via Vacas valley or traverse to Plaza de Mulas and out via Horcones valley. The latter is more often a case due to faster hike out of the mountain, but it requires more complex logistics with duffels and gear. Plaza Francia is a starting point for technical ascents on the South Wall. This is technical in the full meaning of the word. If that is your choice – I’m taking my hat off. You definitely know your stuff.